December is right around the corner, and at this point in the year, most companies have a show under their belts, and the theatre season is well under way! Between G&S JR, Workshops, Auditions and Performances, we have plenty going on at Morpheus these days! Don’t forget that GIFT CERTIFICATES make a great holiday gift! We also invite the community to make proposals for SHOWS to be produced during our 2019/2020 season. 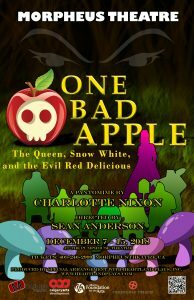 DECEMBER 7 – 15 – ONE BAD APPLE – The classic tale of Snow White, the Evil Queen and the 7 Dwarves re-imagined for this year’s Family-Friendly Holiday Panto! Buy tickets HERE! December 15 – Last day of G&S JR Theatre School before holidays! December 31 – Deadline for Submitting to Direct a show for 2019-2020. Click HERE for details. January 6 – G&S Singers resumes – Join our non-audition chorus for laughter, patter and music! Click on the link for an update on the Singers!